A Republican state senator who advocated for last-minute changes to the state budget will now serve on the committee that helps oversee state finances. 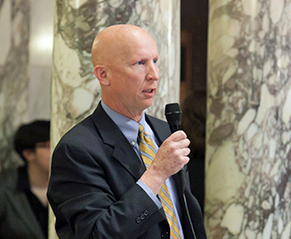 State Senator Duey Stroebel (R-Saukville) was appointed Wednesday to serve on the Legislature’s Joint Finance Committee, which contains lawmakers from both the Senate and Assembly. Stroebel is filling a vacancy created by the resignation of former state Senator Sheila Harsdorf, who was recently appointed by Governor Scott Walker to serve as secretary of the state Department of Agriculture, Trade, and Consumer Protection. In a statement, Stroebel said he was looking forward to using his private sector experience, where he has worked in real estate for about 30 years. “As a member of the Joint Finance Committee, I will dig deeply into the budget looking for bold reforms that reduce government’s size and spend our scarce taxpayer resources more effectively,” Stroebel said. Stroebel was one of three Senate Republicans who delayed passage of the state budget earlier this year, after they refused to vote for the bill until they had veto assurances from the governor. The standoff strained relationships between the Senate and the Assembly, and prompted Speaker Robin Vos to accuse Senators of holding the budget hostage to get their way.